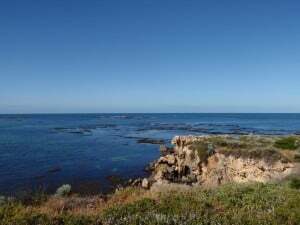 Point Peron is a well known fishing destination in Rockingham. It has several large reefs, caves and a lot of fish to catch. For a location so close to Perth it is well worth a look at, whether you want to fish off the rocks, beach or even go snorkelling. Personally I often take my spear gun, but you need to be aware of where the sanctuary zone starts (see below). Crayfish are abundant out deeper, but picking the right day can be challenging. To go out further you need to be confident in swimming and staying underwater. Often they are found in water deeper than 10 metres, so SCUBA is a good idea. Alternatively if you are able to dive that deep safely then you can make use of free air! Point Peron is basically the western most tip of Rockingham. You can get to Point Peron from Perth in about 35 minutes, driving down the Kwinana freeway and then onto Thomas and then Patterson Road. You then need to turn left at Parkin Street, and then at the end of the street right and first left onto Point Peron Road. The main car park is quite big and there is a lookout just south. You should be able to see several islands south as well (inside of the Shoalwater Marine Park). Even if you aren’t into the whole fishing thing its worth a look, as there is a nice beach, and a nice walk to the point. This is one of the best looking marine environments anywhere near Cockburn Sound, which makes it very popular. To be totally honest, it’s quite difficult to find information on where you can and cannot spearfish in Western Australia, particularly around Perth. Even when you ring the DEC you can be put through to several different people before you find one that actually knows the answer! According to the dec.wa.gov.au website, you are allowed to spearfish at Point Peron, but only north of the Shoalwater Marine Zone. Basically you can spearfish anywhere directly west of the car park and north of it, but you can’t go south at all (unless you are west enough to stay out of the marine zone). 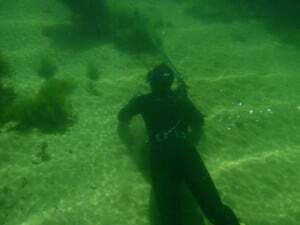 I have been spear fishing several times at Point Peron, and although a few of the days we have picked were not the best, we still had a lot of fun. There are quite a few little fish swimming around (with the occasional decent sized fish). There are also several caves which you can swim through (particularly right at the point) which often house some nice fish. We regularly see sweep, Skippy and buff brim. I have heard that the buff brim (or silver drummers) are not any good to eat, but you are more than welcome to try! If you really want some decent fish you need to head out further, where most people don’t go. In the right season, Crayfish are abundant out further from Point Peron. The water drops off quite deep as you go out further, so if you can’t swim to 10 metres underwater you might struggle to get them. In saying that, go and have a look because you can get lucky! Considering how close it is to Perth, its well worth a look to see if you can get any of these orange critters. Dolphins are often seen at Point Peron (see the picture). They can give you a big fright if you are diving, but they are friendly and will usually hang around long enough to take a few snaps. It’s not uncommon to see four or five straight out from the beach feeding and playing around. 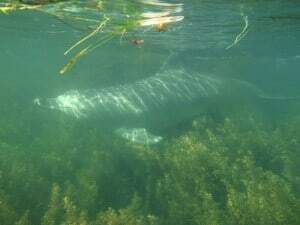 They are truly magnificent creatures and great to swim with! Point Peron’s great coloured water. Like any location to go fishing or snorkelling, picking the right weather is everything. This is particularly the case if you want to jump in the water with a mask. On a poor day the sand will be all messed up and you will have terrible visibility. This makes it almost impossible to see any fish and crayfish, and makes for an unpleasant dive. You can get away with fishing from a boat or off the shore even when it’s murky, but you still want the wind to be calm and the swell to be down. 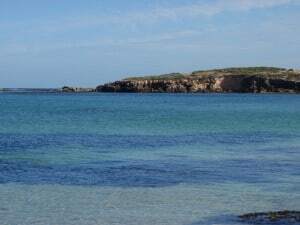 Generally the better days at Point Peron are when the tide is not low, and when the wind has been blowing off shore for a day or two. 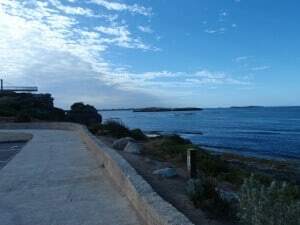 Shoalwater Marine Park starts just south of the car park, and heads south to the Islands and then finishes further south. The above link is to the dec.wa.gov.au where you can download a PDF file of where the marine park starts. I would suggest double checking with a live person as to where you can actually go (although be prepared to be put through several times to different people!). You are not allowed to spearfish with scuba tanks in the area, but you can get Cray fish on scuba tanks. The better fishing at Point Peron tends to be north of the Car Park, but it really depends on the weather and what you are using. A number of people like to launch their boats and sit just outside of the reef, where less people are able to go. 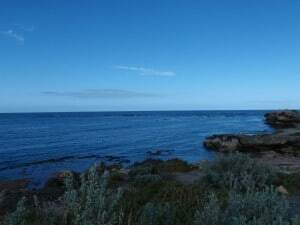 Overall, Point Peron is a great place to have a look, and if you feel like throwing a line in or getting wet then you are bound to have fun. I love your blog… I am a West Aussie, but I live and work in France.. I am coming home dec and jan and want to take my friends camping, fishing, swimming, diving etc somewhere relatively close to Perth, preferably a few hours.. I am pretty familiar with the down south areas… although I was thinking about Wedge island..Please can you tell me where YOU would go, considering we have 2wd and 4wd…. Where is the best fishing and beautiful place? Thankyou so much for all of your information and time. That’s a good question, and a difficult one to answer on my behalf! It really comes down to the amenities that you want access to, how long you are going for and what you have in terms of a camping set up. Wedge Island is good, although the good diving is all around the island, which is a fair swim! If you are prepared to drive a bit further you could camp at Sandy Cape, Hill River, Lucky Bay or even Wagoe. Sandy Cape has some great camping just south of the main campsite, and you don’t have to pay for it. Hill River is usually quiet and has some good fishing in the river and the ocean. If you want the best fishing, then drive to Wagoe and stay on the farm. You can either rent out a chalet or just camp on their property. Lucky Bay is free camping and is well worth the drive; its great for everything from four wheel driving through to riding motorbikes around, fishing, swimming and snorkeling. There is plenty of room to camp there too, either behind the dunes or right on the beach. I would probably recommend Lucky Bay the most, but it is a bit further than what you wanted to do. In saying that, in January it will be quite warm and flies can be an issue. Maybe you would be better going to Pemberton and Lake Jasper? There is a lot of choice down there.